Sid was reclining on a small patch of grass in the dirt under a squat palm when the mist broke and began to fall, casting a haze like a fisherman’s net over the city sky grown dim yellow. Fine drizzle came fast until it turned to rain that fell in fat, heavy drops. Sid’s things were getting wet, so he rose to look for his working umbrella, which he had first found in the parking lot of one of the shabbier hotels at the end of the Waikiki strip. Although the umbrella was well used, it still worked even back then so he thought it strange that someone considered it rubbish. He pulled it from the bottom of his pile and tried sliding the runner up the tube four or five times, until it finally caught on the top spring. Good. One of the ribs had snapped but the partial canopy was enough to cover most of his cart. Sid was proud of his possessions, and he had a longstanding success both in keeping them dry and safe from thieves. The only exception was an old blue tarp he once kept as a makeshift roof that went missing without explanation. For about a week, Sid had been feeling ill at ease. He wasn’t sleeping well, he had a strange appetite that left him either ravenous or repulsed by the sight of food, he was moody, and so on. This sort of change in his demeanor happened to a greater or lesser degree whenever he had to move. The cycle of movement was commonplace not only for Sid, but also for other members of the unfortunate class, to which Sid belonged. Every so often, informal villages of unfortunates gather and grow. It begins with a few and then after about a month it multiplies to the point that it is disruptive to the things around it and its inhabitants must be displaced, resulting in a significant diaspora whose members must find a new home. The laws regulating the lives of the unfortunates are drafted, passed and enforced with a savage urgency that is absent from the legislative character of other cities. This is met, in turn, with ingenuity that one would hardly believe possible by ostensible illiterates. The result of the dialectic is as one would expect: namely, a cycle of arrival and departure as natural and eternal as the seasons. The only distinction between the two processes being that in the former, nothing is reborn. 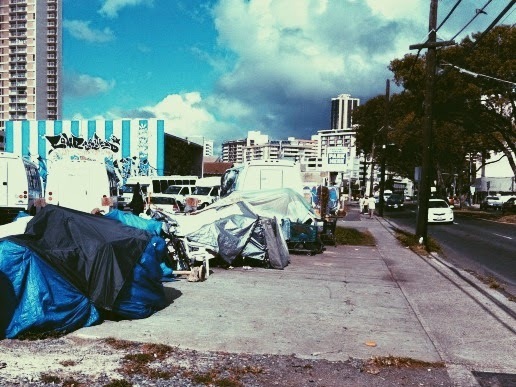 At any rate, in this instance Sid had lived comfortably in the center of Kapiolani Park, but then he was evicted and relocated himself to a place on the west of the canal outside of Waikiki, a thin strip of grass before a gravel lot with a small recycling operation. At first, his only neighbor was a garrulous old haole woman with a pruneface and bad manners. Sid hated talking with her—she could endlessly decry local politics, heaving and pouting impotently like a Pufferfish without any poison. Since she was from the mainland and remained on Oahu by choice, Sid often considered asking, first, how she had come to join him on the canal, and second, why she didn’t go back where she came from. But he thought better of it and instead of inviting the old haole woman’s self-indulgent, wandering reply, he chose to keep things between them polite yet reserved. Oahu’s unfortunate class—as you might have read or seen—is a diverse, curious lot. The haole woman, while an unfortunate, does not consider herself as such. She is of the sort that denies the obviousness of their destitution. They are the consumers, constantly acquiring new things and discarding the old things they no longer want. They have grown numb to the legal imperatives for eternal relocation, or they somehow manage to stay ahead of them. They obey the law and move when they must, but one can see their desire for a more permanent life in each new home they create, obstinately refusing their own transience. Then, there are the industrious ones. Many of these are attracted to the pavement in front of the recycling centers as a means to a less formal employment than a wage-earning job. They go shirtless—a matter of convenience as opposed to want, for the breeze on their backs cools them—while they push their shopping carts up and down the littered streets. Like pigeons pecking at rice, they bend to peer into every trash can on every corner during their 24-hour workday, sorting bottles and cans from the tide of refuse that both threaten and invigorate their way of life. There are also the proud, marching across the island with stern conviction with their sharp, obsidian jaw clenched so that it always seems on the verge of piercing its leathery sheath. Sid knew many of this kind of men, and he had heard stories of many as well; had they the fortune to inhabit a more glorious epoch, some might have been Hectors or Ajaxes. Their scowl impresses and terrifies both those like them and their opposites, the fortunates, who scamper at their approach. Yet, a few don’t run, those to whom the proud drop a nod of respect for mysterious reasons that will follow them beneath the sand. There are the partial—those that were once whole but are now like wandering spirits, both in the material world and not. Their eyes look skyward— perhaps with the remainder of their soul they seek that portion of it they lost long ago, in the days of their youth when they refused to refuse, out of the twisted principles they have long since abandoned. Prone to irrational outbursts of supernatural revelation and anger, they are often-ferocious, nocturnal man-creatures, dangling their toes over the precipice of insanity. Finally, there are the broken—shaggy, wild men wandering aimlessly along the same paths they have always wandered. One speculates on the former lives of the broken, if they once had aim. Reason would affirm that in the uncertain past these men had been soft, pink infants in their mothers’ arms. Looking at them now, it is impossible to imagine them in such a state. They must have been born as mute, full-grown men covered in filth, immediately abandoned to the world to survive alone as best as anyone alone can survive. He lost it somewhere on the road. It might have happened at the cove, where he slept one night on his way to town. If he lost it there, then it might now be at the bottom of the sea, or caught in the belly of a large fish, or built into a mountain bird’s nest—it was somewhere beyond his reach which meant it was gone and could therefore be easily forgotten. Who, however, had he consequently become? It was his unconscious belief that since that day he had unalienably become no one, and that was that. While waiting for the rain to end, Sid had nothing to do but check his inventory: a seat cushion from a comfortable lawn chair, a bike rack, nine plastic bottles (some empty, some not), three tattered bamboo beach mats, a nylon tote bag with the phrase Have a Pleasant Day Hawaii silkscreened on one side, a change of shirts, a change of board shorts, several undergarments, an old sun hat, a rusty bike chain, etc. He recently moved his most valuable item from a pencil-box at the bottom of his pile to his left pants-pocket—it was a miniature replica of an old skateboard with the image of a red dragon that his father had given him shortly before he died. Sid felt connected to his father whenever he held it, which both comforted and grieved him. One day he hoped to have it made into a necklace, always near his heart. In fact, he had a small savings in his right pocket for that purpose, although he had no idea what it might cost and wasn’t sure how to find out. Most mornings after reading the previous day’s newspaper, he rode the gift over and around a smooth stone he kept as a miniature skate park. That was his time to escape, and to think fond thoughts. As usual, the rain didn’t last long and he calculated that it was probably safe to close his umbrella and he buried it again in his horde. Sid dug at his scalp, which bothered him ever since he got a case of tinea capitis after a three-dollar night at IHS. He knew there wasn’t much to be done about it; salt water eased the discomfort, so he’d go later for a night-swim. First, however, he needed to eat. From the savings in his right pocket he counted several bills and two dollars in change, which matched his count from the previous night. Fast food was never his first choice but it would leave him full and with money left over. This appealed to his dream of soon converting his father’s gift into a necklace, and he left his spot on the side of the road, slowly wheeling east.